We call this home an "experience" for a reason - its so unique, the property is amazingly beautiful, and there is so much to do with your family and loved ones. Its buried in a secluded and private National Forest, but is just 5 miles from Blackhawk and Central City too. It is a must to read my guest book and hear all the amazing things previous guests have said about their stay. - Gushing Mountain Stream next to Cabin - great for your morning coffee or evening happy hour! - We LOVE our cabin so much, my wife spent Approx. 400 hours building a near exact 1/12th Scale Replica of it! Its there for you to enjoy...and of course its lit up like crazy :) You can see 1 photo of it here, but we didn't want to spoil all the surprises when you see it in person. - A secret 4- mile long PRIVATE hiking trail starts 20 feet from the cabin - you'll never see another human on it! - Awesome indoor/outdoor sound system! I do audio/video for my day job so it...sounds....GOOD! Did someone say Dance Party? - Campfire Ring, Tree Hammock, & Patio Next to Stream! Gold Panning is also on-site, and all kinds of nooks and crannies to explore all around the property. - Lighting - I'm a bit of a lighting nutcase. I feel that lighting makes or breaks a space, so everything indoors and out has been done professionally and is spectacular. The property has over 50 (!!!) outdoor landscape lighting fixtures to illuminate the entire property and forest at night. It looks like Four Seasons. Inside there's even dancing flame candles hardwired with switches. This is hi-tech rustic ambience! - Beautiful Master Loft overlooking entire Cabin! Plus a main level private bedroom, and a kids treehouse loft bedroom. The treehouse loft is mostly meant for kids, but its a cool place to hang out in too. Includes a twin bed, and Directv & DVD player. - Property is located about 1 hour from Denver and it is very easy to get to - no I-70 traffic regardless of when you arrive or leave which is awesome. - Real Gold Mining can be done year round just a few miles from the Cabin! At www.goldstrikeadventures.com you get to use a Sluice Box, A Trommel, A Wash plant, or even do under water suction dredging if you want! (oh...and keep everything you find!). 4-wheelers can be rented and delivered to the cabin if desired. Information is also at the cabin for local dining, casinos, fishing, grocery stores, hiking, jeep trails, etc. You can 4-wheel/ATV right off the property and into endless amounts of trails leading all the way to the Continental Divide, Winter Park, St. Mary's Glacier, and everywhere in between. There are endless amount of trails for exploring just up the road from the cabin. Golden Gate National Park is also only 15 minutes away. I can't overstate how awesome the 4-mile hiking trail is off the back of the Cabin...plan to be gone for a few hours! Roads are plowed and maintained by the City of Black Hawk all the way to the cabin. Accessible year round. Complimentary Chocolate and Coffee are provided. All linens, Firewood, and Wood Stove Pellets are also provided. Easy check-in. A 4-digit access code will give you access for the length of your stay. This place was like a childhood dream come true for me. Everything about it...is...perfect. I wouldn't change a thing. My wife is a real estate agent, and she's been looking in the mountains for years for another property like it for us to buy in addition, and we just can't find anything like this one. Its so special in that it has the river, ultimate privacy, the true 'log' home feel, big & open, no neighbors, the private hiking trail, surrounded by national forest, etc. Its not hard to find most of those...but getting all of them in 1 property without spending $2M is not easy. This Cabin is a labor of love for me and my family. We constantly upgrade it without hesitation. Because we use it so much ourselves...its so worth spending $ on to make it better. I've had families that have stayed here every year for the last 10 years, and its really fun upgrading it for them too so there is always something new to enjoy :) You can just feel the love that went into making this property an experience when you are there, and its not just the grandiose things, its the finest minute details that we think help make your stay here magical. No effort has been spared to make this the most amazing visit that we possibly can for you. The compliments and endless thank you's I get from my guests warm my heart and motivate me even to make everyone's stay special. Never needed even in the summer! Forced Air Furnace. Although the pellet stove can heat the cabin enough on its own most of the year. A beautiful stone fireplace and plenty of firewood supplied! The wood stove is wonderful! It allows you to have a zero-maintenance fire 24/7 at the cabin! Puts out some great heat too. Wonderful ambience! Many of my guests have left my cabin and decided to buy a wood stove for themselves because they loved mine so much. All provided. Its a well stocked kitchen. 55" HD Sony LED + Directv HD DVR and Bluray. Small kids TV in upstairs loft. 150 channels of Hi-Def DirecTV! Kids Loft also has its own satellite receiver, dvd player, and TV for the kids. Also a very nice iPod docking station (with good bass) allows you to dock any iPod or iPhone and enjoy your own music throughout the Cabin. Yes - a VERY high quality indoor and outdoor sound system is ready for you to bluetooth too right from your device! A HUGE movie library with about 200 DVD's is there. A great selection for kids and adults. A wonderful Trex deck with post lights and a beautiful backyard space for grilling, eating, having a campfire, laying in a hammock, etc. Beautiful landscape lighting is very inviting at night as well! This is the only Cabin you can rent where you have your own, private nature trail leading straight off the back of the cabin and up the mountain! You will NEVER run into another hiker on this trail, as you travel through dense forest, moss covered rock, and pristine wilderness as you climb over 1/2 mile up the mountain ridge :) Heat Sources: Propane Furnace, Wood burning Pellet Stove and Stone Fireplace. Plus Outdoor Fire-Ring for Campfires! -DirecTV (150+ channels!) -Water Purification System -300+ Thread Count Bedding -Moen faucets/shower heads -Floor to Ceiling Windows -Beautiful Master Loft overlooking entire house! -Private 2nd Bedroom -Rustic Custom Log Cabin Furniture -(2) New Queen Size Beds + Extra Linens -Tree Hammock next to River - Phone, TV, DVD Player + DVD Library, very nice iPod Music System, Full Kitchen, Microwave, Dishwasher, Refrigerator, Ice Maker, Blender, Toaster, Coffee Machine, Gas Grill (BBQ), Gold Panning, and Treasure Hunts (x2 - indoor & outdoor) ! To do around it this is the perfect hideaway. My girlfriend and I stayed here in early February 2019 and we had a great time. 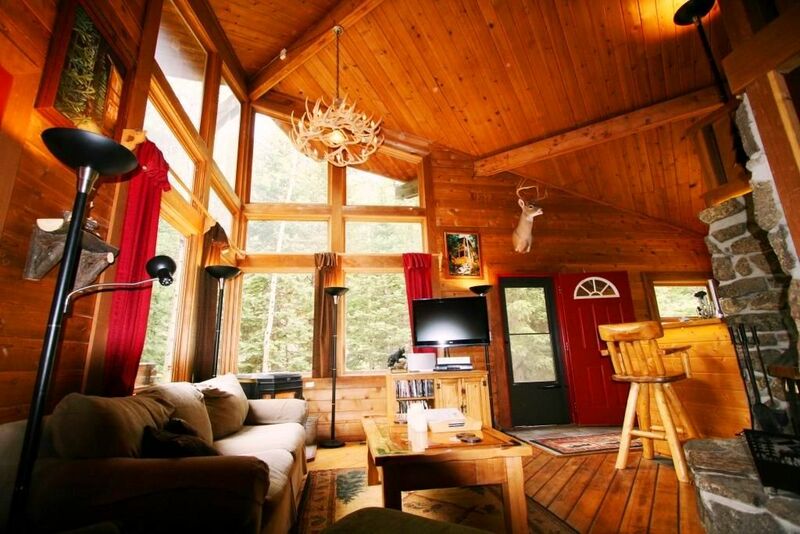 The cabin is beautiful, secluded, and has everything you need to stay cozy and warm. It has a ton of character and you can tell Brian and his family absolutely love this place. We ended up getting about 9 inches of snow overnight and the entire area looked like a winter wonderland. Brian did a great job of messaging us and making sure we had what we needed. Access to the cabin was a breeze. Even with all of the snowfall, the road was in great shape and we saw a snow plow come by at least twice on the day it snowed to keep the road cleared. The cabin was well stocked, plenty of hot water, and stayed warm even though the temperatures outside were below zero. The decor and lighting were top notch and the whole space just generally has a great vibe. And the best part about it is that we were able to bring our dog Lucy! Brian's cabin is awesome and I would highly recommend it for anyone looking for a more authentic mountain cabin experience far away from the busy resort mountain ski towns of summit county. Brian has created an ideal getaway spot for a small group or family. There are beautiful trails right on the property, and many more nearby, some for all levels of ability / interests. In between outdoor adventures, the kids (ages 9 and 12) loved the movies and especially the treasure hunt, which was incredibly creative, fun, challenging, and unusual. We plan on returning in the summer sometime to do the outdoor puzzles as well! We loved our time at the cabin. The scavenger hunt was fun for the whole family. The cabin was remarkably well stocked and very comfortable. Highly recommend. We loved it so much that we extended are stay!! Blackhawk, Central City, Golden Evergreen. The Cabin feels like it is in a very isolated area, yet Blackhawk/Central City is only 5 miles away. Thick forest and 100-foot tall Evergreens surround the cabin in all directions. Your own gushing stream will make you want to spend all your time outside!. There is also a 100% private 4 mile hiking trail going up the mountain for Cabin guests only! Information on dining, attractions, trails, etc. is all at the cabin. Activities: Hiking, 4-wheelers, Snowmobiles, Fishing, Campfires, Skiing (Eldora Ski Area), Gambling, Shopping, Restaurants, Wildlife Viewing, Cross-Country Skiing, and Sledding... or just Relaxing! • Feel free to ask if I'm running any specials! I can sometimes offer discounts for 3-6 night stays, or last minute bookings. Just ask! :) * Please ask us for holiday rates as those may vary from the regular seasons pricing. * A cleaning fee may be required for shorter stays. I can often waive it for full week stays.